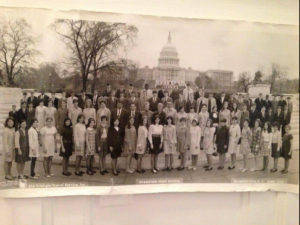 On April 4, 1968, a group of Evanston Township High School (ETHS) students and their adult chaperones were in Washington, D.C., on a spring-break visit to the nation’s capital. Until about 7:30 p.m. or so that day, the trip had gone as planned. But as we approached the entrance to the Jefferson Memorial, which we were visiting that evening, we found the site blocked off, with signs saying the monument was closed due to the death of Martin Luther King Jr. It was the first we had heard of the assassination. We were shocked and confused. From that moment, the entire trip to Washington took on an added, poignant significance. My recollection is that our chaperones rushed us back to the motel where we were staying. I recall a sense of confusion during that evening. One friend who was on the trip believes we went to Ford’s Theater that night and on leaving, witnessed rioting at the end of the block. We know violence broke out in various parts of the city that night. I think the trip was supposed to last until Saturday but we returned to Evanston Friday instead. As our plane rose over the capital, we had clear views of fires that had been set around the city. From the sky, we saw fires blazing in other locations as we flew across the country, as well. Some of those may well have been around Chicago, where, over the next two days, 10,500 police, more than 6,700 Illinois National Guardsmen and 5,000 regular Army troops were sent in to quell the rioting, and Mayor Daley issued an infamous shoot-to-kill arsonists order.